These are the most frequently asked questions we receive from our customers. It will save you time and frustration. 1. What do I need to know to get into FPV? FPV stands for First Person View. In order to do FPV you will need a camera, transmitter, receiver, antennas, and a video display. These components are the "core" and the most important items responsible for quality and performance of an FPV system, anything else is just bells and whistles. The camera needs to be connected to the transmitter which will send video wirelessly to a receiver that will be connected to the video display. The transmitter: is responsible for transmiting/sending audio and video wirelessly to the transmitter, and it can handle basically any analog camera. Some digital cameras provide analog video signal that can also be compatible with our FPV systems. The camera: is responsible for image quality of your FPV system,and it connects directly to the transmitter. Investing in a good camera is very important if image quality matters to you. The receiver: is responsible for receiving the signal sent by the transmitter. One of the most important features in a transmitter is the sensibility, the more sensitivity the better the receiver will "listen" to the signal sent by the transmitter. The video display: is responsible for displaying the video received by the receiver. One of the most important features a video display for FPV can have, is the ability to show some image when video signal is weak or poor, without going to a solid black or blue screen; which is not a good thing to happen when doing FPV. The Antennas: Are responsible for sending and receiving video signal. Antennas have a very important role in the performance of your FPV system. The bigger the sensibility of the Antenna connected to the receiver, the better and the stronger the video signal will be. The antenna is the ear of the receiver, the more sensitivity (dBi) the antenna has. the clearer the receiver will "hear" and understand the transmitter. Just be careful because some antennas with very high sensitivity have a tendency to be directional; in other words, it must be pointing towards the transmitter. Most importantly, when starting with FPV is to start simple but right. Avoid adding bells and whistles to your system, simplify everything. Start basically only with a good camera, transmitter and receiver and upgrade your stock antennas for better performance. If you’re planning to fly around the park within 1 mile or less, then a good set of circular polarized antennas is a good way to go. For a long range flight, a patch antenna for your receiver and a “Whip” or “VEE” linear polarization will do the job. Distance between the r/c receiver and the video transmitter is a must, the bigger the distance between them the better the results! Also keep in mind that the further you go with your model, the higher it must be to avoid loosing signal. Choose a stable airplane preferably with no ailerons, just rudder and elevator (example: Easy Star, Slow Stick...). Avoid windy days. Whenever you go fly your r/c airplane with FPV system, find an open area to fly (no buildings, tall trees or freeways). If it’s possible, go to Google earth and observe carefully the aerial view for the area, and try to keep the landmarks in mind to help you figure out your position in the air. As soon as you take off, go to a decent altitude for better view, maybe 100’-200” (30-60mts) high should help. Take someone with you to be your spotter to watch your plane while you’re flying. All of this will give you a more comfortable flight and you will have a good first time experience with FPV... which is very important. It's very common for a a/v transmitter to get hot due to its power and the small size. Just keep it with as much air flow as possible to keep it cooler. FPV is a fantastic and amazing hobby, and there is a learning process that should not be ignored. Don't be lazy, read as much as you can to learn the details about FPV, and it will significantly help you to troubleshoot and improve the performance of your FPV system. 2. What is the best FPV system? There are many things to consider that will help you to select the best system for you. First of all, what might be the best system for you doesn't mean that will be the best system to everybody else, and vice versa. It all comes down to what you expect from your FPV the system and budget. The first thing to consider is find out what band (frequency) of FPV setup you can use. If the radio control system (R/C system) of your aircraft/vehicle is on 2.4 GHz frequency , than you can only use the following systems: 900 MHz, 1.2/1.3 GHz or 5.8 GHz FPV . If your remote controlled vehicle has 27, 40, 72 or 75 MHz radios, then basically any of our FPV system is suitable to you. FPV systems on 1.3 GHz or lower frequencies have much better performance flying around trees and obstacles than 5.8 GHz system. Many people don't know, but Fatshark video glasses can be used with any FPV we carry. All Fatshark video glasses come with A/V cable allowing you to use the glasses with any analogue video devices, even DVD players. Always avoid having the FPV system and R/C gear in the same band, it can cause interference and eventually loss of control of your R/C model. Typically the more output the transmitter has the, bigger its range will be. Thus the "Further Away" you will have to instal the video transmitter from the R/C receiver even if they're not the same frequency (band). If your RC model has a small limited area, then we suggest using a transmitter with lower amount of milliwatts (mW). If your model is big enough allowing you to instal a 1000mW (1W) transmitter at least 15" inches away form the RC receiver, then the FPV1012 1.2 GHz 1000mW will be a nice option to go with. Upgrading the stock antennas of your system is a must, and it will definitely improve the performance of it. In fact a 400mW FPV system with upgraded antennas can easily surpass the performance of a 600mW system with stock antennas. If you just want to try the FPV with your model and don’t want to spend too much money without having to deal with soldering and messy wires, then theFPV Plug and Play Starter Kits are the best option not only for beginners but advanced users also. 3. What frequency is better? Signal strength is one of the most import features for FPV. Lower frequencies travel further than higher ones. Lower frequencies also have better obstacle penetration, such as trees, buildings or even clouds. That means, a 500mW transmitter on 900 MHz has a much stronger signal compared to 5.8 GHz, and the difference is big. The advantage of higher frequency devices is that the antennas are typically smaller. 4. What is the range of the FPV system? How far can I go with the FPV system? Range can be affected by many factors, such as how far the video transmitter is installed from all the other electronics, type and position of the antennas in use, the height of the receiver's antenna, heavy signal broadcasting around the area of operation, trees and buildings that can weaken, block or even reflect the signal known as "Multipath" confusing the receiver with double signal. High frequency signal such as 5.8 GHz can be affected by clouds or even high humidity in the air, lower frequencies such as 900 MHz, 1.2 /1.3 GHz and 2.4 GHz have stronger signal and better obstacle penetration than 5.8 GHz systems. As already mentioned, the type of antennas used with the system is one of the major and important factors that affects the performance, integrity and quality of the signal, and reception quality. We have customers using our 1.2/1.3 MHz 1000mW system where the performance can vary from 1 mile (with the stock antennas), and up to 10-20 miles (with high grade antenna on the transmitter and directional antennas to the receiver). Since there are so many variables involved, it would be impossible to determine specifically what range each FPV each setup and installation will have. 5. What is the difference between the "FPV Plug and Play Starter Kit" and the "FPV Set Receiver + Transmitter"? The FPV Plug and Play Starter Kits is definitely the way to start on FPV, mainly because the transmitter is very easy to use. It comes ready to use with built-in microphone, LED power indicator, reverse polarity protection circuit, and the wires you need to plug your battery and camera. The FPV Set Receiver + Transmitter requires soldering and some basic knowledge with electronics. The wires and connections need to be customized and must be done by the user. It has audio capabilities, but the transmitter does not come with a built-in microphone (which is really important to hear what is going on with your plane in case of a servo jittering or the motor stops running.) Over all, the performance/range is the same as the Plug and Play kits. Click here for illustration. 6. How to test the range of your fpv system. - The best way to check the range of your FPV system is in the air, preferably with a spotter to avoid losing your RC model. Ground range check will give you very short ranges when compared to aerial. - Keep the antennas for the receiver/transmitter in the upright position for optimized performance. - Instal the transmitter as far as you can from any other electronics i.e. ESC, motor even camera. - For best reception, the receiver's antenna must be placed under open sky, with no obstructions such as roof, building, under trees, inside of trailer or car etc. 7. Is it recommended to use a high gain antenna with my receiver? Even within the range of 200 meters (600’ feet) you will have some RF noise and inevitable video drops, which is very common when you have any analog transmitter in movement. We highly recommend the use of a high gain antenna with your receiver. It will not only increase the range but it will also decrease video drops considerably. The 8dBi antenna does a great job! 8. Can boradcasted video be recorded while view in on a ground display or goggles? Yes, you can use a cable splitter and mini video amplifier up to 4x video displays. For example, you can have 2x video glasses, 1x big screen and 1x recorder (example: VR1500 Recorder) connected to the video amplifier at the same time without quality drop. 9. What is the minimum altitude I should fly if my aircraft is about 1/4 miles away? There is no specific rule, but a good rule of thumb would be: flying at a minimum of 250' feet high for every 1/4 mile, or 500' at 1/2 miles away. 10. What do i do if my OSD GPS function is not working properly or not finding any satellite? If you place the GPS near the video transmitter, the GPS will not work properly. You may need a low pass filter between the video transmitter and its antenna. Make sure the GPS antenna is pointing to the sky, and don't place any electronic devices near the GPS to avoid interferences, otherwise, the GPS will not properly fix the position. If the GPS fixes the position, the OSD and the GPS are working properly. If the position is inaccurate, the problem is the system installation. 11. What is a Head Tracker? Head tracker is a very handy device used for FPV. It gives you the ability to control a camera Pan/Tilt system using the movements of your head. The Head tracker is normally attached to your head using a hat, cap or even to the video glasses. (Your camera servos are connected to the model’s receiver). 12. How do I get a HAM license in US? All you need to legally operate an FPV system in USA is getting the "Technician" class exam required by the AMA and FCC (AMA 550) to operate FPV video transmitters on the amateur bands. Getting your HAM license is quite simple and it's not hard if you have directions. Besides you will learn powerful information that will help you to improve the performance and operation of your wireless system. To pass the Technician class exam, you must answer 26 of 35 multiple choice questions correctly. This information can be found on the www.fcc.gov website. U.S. licenses are good for 10 years before they have to be renewed. You can read more about renewing here. The test costs around $15 and you will need to bring a legal photo ID, Social Security card, two 2 pencils, and a pen. You can read more about what to bring on the ARRL website. The American Radio Relay League (ARRL) is a great resource for Ham operators. I suggest you browse through their website and learn about HAM. These are very helpful links. 13. What antenna should I purchase for my 5.8 GHz system? For a coverage mid-range and no multipath issues: BlueBeam Clover-leaves or Spironets. For long range and no multipath issues: Skew Plannar for transmitter and Heliaxial for the receiver. 14. What does MHz, GHz and mW mean on the transmitters? The abbreviation Hz is a unit used to measure frequency. In other other words, 1 hertz = 1 cycle per second, 1MHz megahertz is 1 million cycles per second, 1GHz Gigahertz is 1 billion cycles per second. 15. To watch flight in real-time, should I buy an LCD display or video glasses (goggles)? It's all about preference and budget. To start up, a good LCD/LED monitor with sun-shade mounted on a camera tripod will work great. Besides, you can share the flight with other people too. Just make sure the monitor is specific for FPV, and the screen doesn't go to a solid blue or black screen when you have poor signal or brief drop. Then later after you get more comfortable with FPV flight, you can get the full FPV immersion having video glasses. However you can split the video signal from the receiver and still have your LCD monitor to share your real-time flight with other people. 16. Why certain transmitters are not legal in US and some have channels locked for US customers? Transmitters that provide ONLY frequencies from 960 MHz - 1215 MHz are illegal to operate in US territory and many other countries as well, because these frequencies are strictly reserved for aeronautical radio-navigation such as NAVAID (TACAN / DME, etc.). For this reason only transmitters on 910 MHz, 1258 MHz and 1280 MHz are available to US customers. Make sure you're complying with your country's laws. 17. What is multipath and how to deal with it? Multipath occurs when part of the signal being broadcasted by the transmitter is reflected by a obstacle i.e. buildings, hills, trees. The reflected RF waves travel farther and arrive later in time than the direct RF wave.The reflected wave arrives at the receiver with a slight delay than the unreflected causing the wave signals to overlap, which confuses the receiver. The desired wave is combined with many reflected waves in the receiver, even though the signal strength is high, the signal quality is poor. A good remedy is to avoid areas with to many obstacles, also using either right or left handed circular polarized antennas on both receiver and transmitter. Broadcasted signal through circular polarized antennas will change its orientation when reflected. In other words, if part of a right handed circular polarized signal is reflected it turns to a left handed circular polarized singal thus it will be rejected by the receiver with a right handed circular polarized antenna. 18. Is the remote control Long Range System (LRS) compatible with any FPV system? Yes, but it is highly recommended installing a High Pass Filter on the FPV video receiver, between the receiver and its antenna, mainly if your FPV is on 900 MHz and 1.2/1.3 GHz. You can also install the High Pass Filter on 2.4 GHz as well, does not matter what brand will receive are you using, they all the hit by harmonics generated by 433 MHz system. it is also recommended keeping your (LRS) transmitter away from your FPV video receiver. 19. I have a specific application using wireless video. Can Hobby Wireless help or guide me with my project? Understand that Hobby Wireless retails products not services to projects. We recommend searching the internet or using public forums seeking knowledge and ideas that can help you with your project. We can help you providing information about the products we carry. Although if your application is not conventional FPV, we can't tell how you should do it. 20. Can I use GoPro HD camera for FPV piloting? Yes, you can use GoPro for FPV, but only its standard video quality output not HD video output port. We recommend using GoPro camera for recording only, and have a dedicated CCD camera with good image quality for FPV piloting. Dedicated CCD cameras will definitely give superior image quality when compared to GoPro standard video quality. 21. Li-Po Batteries, how to charge and store them? We recommend our customers to charge batteries at maximum rate of 1C. That means the battery mA divided by 1000 = charging in Amps, i.e. a 1800mAh battery pack, will be 1800/1000 =1.8A regardless of how many cells is has. Store your batteries with 3.85v per cell, i.e. a 3S pack 11.6v and 4S pack 15.4v and preferable store them in a dry place without direct sun light and between 40 and 70 degrees F for best results, when transporting keep them from 30-100° F.? 22. What is NTSC, PAL and SECAM? NTSC Standard (National Television System Committee) is used by many countries on the American continent as well as many Asian countries including Japan. PAL standard (Phase Alternating Line) was implemented in most European countries except for France. SECAM standard (Sequential Color Avec Memoire or Sequential Colour with Memory) was implemented in France. © Copyright 2007 Hobby Wireless. All Rights Reserved. 1. Does Hobby Wireless ship to addresses other than the billing address? Answer: No. Unfortunately your shipping and billing addresses must to be the same. We can't ship orders to a different address other than the billing. We're just following the anti-fraud credit card and PayPal rules. The reason is because many fraudsters apply this method to ship products to their home address, and the card holder never knows about the purchase. If your order contains two different addresses, it will be shipped out automatically from our warehouse to your billing address. 2. Does Hobby Wireless ship international orders? Is there a legal way to avoid or minimize this customs duties (importation fees)? Answer: We ship orders worldwide every day without any problems. If you have problems with your country's importation fees (duties, taxes), send us an email to customerservice@hobbywireless.com about it. Or at the checkout page for your order, a comment box is available to write important request/notes about your order. This way our shipping department will read your comments for your order and he will follow your instructions. 3. How much is the shipping cost? Answer: We have a shipping estimator available. To use it, just add to your cart the products you are willing to buy, and then click on "View Cart". Select the country and place your Postal Code. Click on the "UPDATE " button to see all the shipping methods available and the costs. 4. What type of payments does HobbyWireless accept? Answer: We accept domestic or international Credit Cards, PayPal, Money order, e-check, US Postal Check, Western Union (from anywhere in the world) and Gift Cards from: Visa Gift Card - Master Card Gift Card - Wal Mart Money Card. PayPal: This is one of the best and the most secure method of payment online, at no extra charge. Credit Card: Will be accepted via paypal. You do not have to open a PayPal account, just pay using your credit card with no extra charges. PayPal will provide you the best and most secure online payment. Western Union: This payment method can be done from anywhere in the world. It's simple, fast and secure. CLICK HERE TO FIND A WESTERN UNION AGENCY CLOSE TO YOU. Personal Check: Personal checks can be held up to a period of five (5) days until cleared at the bank. Money Order: Pay the order of: Hobby Wireless. Please make sure your money order is signed as well. Cash Orders: Please send it by registered mail for your protection. 5. Problems with our website, Login or any other issue? If the problem persists please email a copy of your PC screen showing the issue by using the "Print Screen" feature. To capture the active screen, hold the ALT and the Print Screen ( "PRTSC" or "PRTSCN") keys to capture the shot. This will save your screen shot. Then press the right button of your mouse to paste it into a Word, PowerPoint document or directly into your email and send it to us. 6. Problems at the checkout page, checkout page freezes. Credit Card payment is not going thru or declined? Answer: 2: Payment not going thru, error, declined... To solve this issue please make sure your credit card has international acceptance. Make sure your credit card and billing address are the same. If the addresses are not the same, call your credit card company and update your billing address. Also make sure your credit card has funds available. If your name and address contain specific characters (ex:Æ, Ø, ñ,ü,ß,ä) avoid them, just use the plain English characters (ex: Niño type Nino). On section marked "From", type your email address. On section marked "Amount", type the total amount of your order including shipping cost. 7. I want to change my account information, how do I do it? 8. Why does Hobby Wireless not provide technical support over the phone? Answer: We used to offer this service, however most of the calls were for basic FPV and RC questions which can be easily found over the public forums or at the product's description, FAQ and Technical Help page. Among many questions there were ones such "what's the difference between lipo and cadmium batteries? ", "what kind of foam is alapor? ", " Is it hard to fly a RC plane?"... Most of the calls were taking no less than 30-40 minutes per call, while customers with complicated questions ended up upset and without support because our phone line was busy. For this reason we have our technician providing his best support through email only, which can be more efficient to explain and help our customers by using illustrations and helpful links. We're sorry for the inconvenience, and we appreciate your understanding. Answer: With that error it could be a number of things. Verify if your PayPal account has your bank information or if you have a credit card on your PayPal account. Otherwise it can cause this 10417 error. Make sure you credit card shipping and billing address are the same, and make sure your credit card or bank account have funds available. Place an order by choosing "check/money order" as a payment selection at the checkout page. Then, send us an e-mail requesting a PayPal money request with your order number. For faster transaction click on the picture below and follow the settings. Making a manual payment for your order is easy, free and very secure. No additional costs and you don't need to have an account with Paypal. Just follow the picture as an example in red on how to fill out the form. Amount: Place the total amount of your order including shipping cost. Select "Goods" and click continue...Click on the PayPal picture below to make a manual payment. 10. No replies from e-mails written to Hobby Wireless? Answer: Your Internet Service Provider (ISP) may use filters to prevent unwanted emails from reaching your inbox. Sometimes, these filters also block messages you want to receive. In most cases, adding us to your list of trusted senders will solve this issue. In AOL, select: "Add Address". in Yahoo! Mail, Outlook or Outlook Express select: "Add to Address Book". Hotmail or MSN, select: "Save Address". If you need further assistance, contact your ISP's technical support department and ask how to "white list" emails from admin@hobbywireless.com, support@hobbywireless.com or customerservice@hobbywireless.com. Please expect a slight delay due to a large volume of e-mail received over the weekend. We only respond to e-mails from Monday through Friday. Also see our Technical Help page. 11. Want to know more details of your package shipped using USPS (United States Postal Service)? You can call USPS service Package Status (800-275-8777) then press 6, and then 4, to obtain detailed shipping status of your package. 12. Will Hobby Wireless ship orders to different address other than the billing address? - If you're paying using credit card, for your own safety the order will be shipped to the address associated with credit card (billing address). Unless you're ordering for a company, US military or US govermment, (upon request and approval). - If you're paying using PayPal, for your own safety the order will be shipped to the address shipping address provided by PayPal. 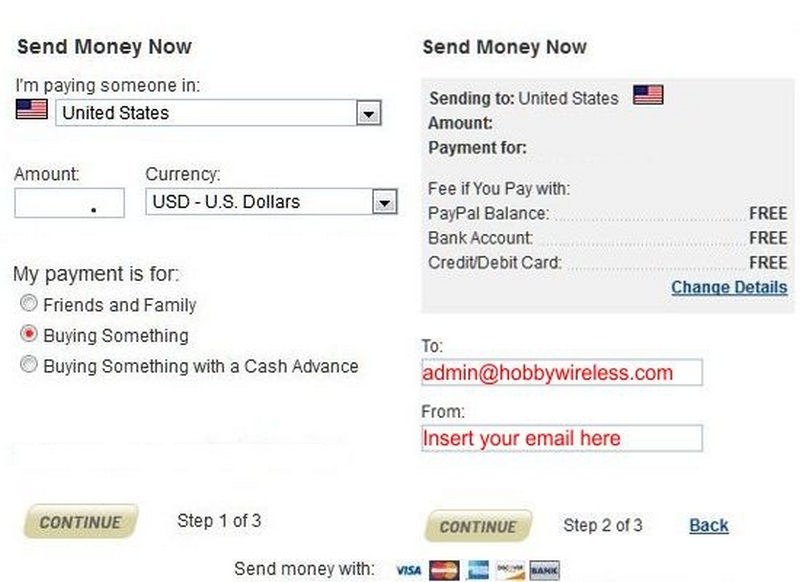 You can change the shipping address by logging into your PayPal account and changing it before ordering from us.